13 | August | 2007 | ZOMG, Candy! 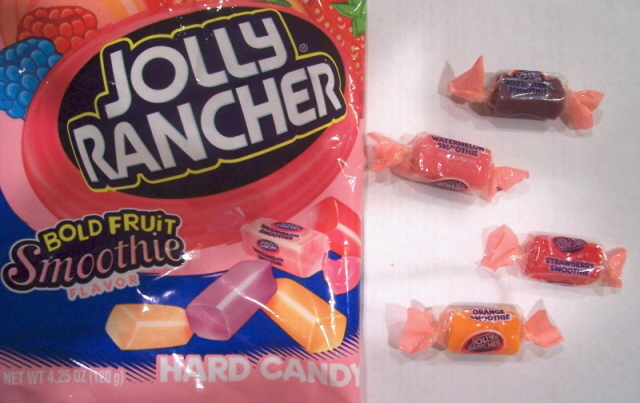 I like Jolly Ranchers (BUY) because I’m neurotic and impatient – I crunch up my hard candies instead of waiting for them to dissolve, so they don’t last very long. Fortunately, Jolly Ranchers don’t crunch very well, so I’m forced to savor them. And Bold Fruit Smoothie flavored Jolly Ranchers are, for the most part, worth savoring. I picked these up at my local mall’s Dollar Tree. Unfortunately, it looks like Hershey’s is no longer making them, as their Jolly Rancher website no longer lists them as a flavor. Apparently they were introduced way back in 2004, but no clear word on if they’re still being made. At any rate, the code on my bag tells me that they’re good until August 2008, so no worries there (Cybele at Candy Blog has the key to deciphering Hershey’s codes). To me, the name Bold Fruit Smoothies seems a bit oxymoronic. I associate smoothies with muted fruit flavors because of the yogurt dilution effect, but these candies are actually boldly flavorful, and yummy to boot. The Bold Fruit Smoothie flavors are peach smoothie, orange smoothie, strawberry smoothie, watermelon smoothie, and mixed berry smoothie. They taste initially of Original Flavored peach, orange, strawberry, watermelon, and raspberry Jolly Ranchers, respectively, followed by a mellow vanilla yogurt or cream flavor. The flavors are surprisingly strong and persist until the entire candy is dissolved. The orange smoothie flavor is my favorite, as the “smoothie factor” is especially prominent. It tastes like an orange creamsicle in hard candy form. The “smoothie factor” was also quite apparent in the strawberry smoothie but was fairly muted in the peach, watermelon, and mixed berry smoothie flavors. I hate raspberry Jolly Ranchers, and I hated the mixed berry smoothie as well. It’s that olfactory raspberry kick that I can’t stand. Try eating a raspberry Jolly Rancher and pinch your nose, and you’ll notice the taste difference immediately. Incidentally, that’s also a fun trick to try while eating Jelly Belly beans. I wish I’d thought to buy a bag of original Jolly Ranchers for comparative purposes. I think the texture of the Smoothies are creamier than regular Jolly Ranchers, and they certainly look creamier, but I’m not sure if it’s just my imagination. At any rate, if you can find a bag, I’d recommend them picking them up, if only for the novelty factor.